"We are the Halluci Nation. We are the tribe they cannot see. Our DNA is of earth and sky. Our DNA is of past and future. We are the Halluci Nation.” These words written and spoken by Indigenous poet, author, musician and activist John Trudell on the first track of A Tribe Called Red’s album We Are The Halluci Nation (2016) reverberate with strength and conviction. Based in Ottawa, A Tribe Called Red (ATCR) currently consists of musicians Bear Witness from the Cayuga First Nation and 2oolman from the Six Nations of the Grand River. Their powerful blend of music mixes traditional pow wow dance music with electronic dance music, otherwise known as EDM. Their collaboration with Trudell on the Halluci Nation album has sparked a movement that continues to grow and expand. With this year’s X Avant festival at the Music Gallery, the Halluci Nation will grow and expand even further. Artistic director David Dacks has invited Bear to be the guest curator for the 13th edition of this annual festival. Bear, in turn, has taken this opportunity to bring together a Canada-wide lineup of artists to create this next iteration of the Halluci Nation. Musically, the overall sound of this festival will be a distinct contrast to earlier festivals, as many of the invited musicians come from backgrounds in the plethora of approaches that have grown out of electronic dance music since the first devices for performing electronic music were developed at the end of the 19th century. With the manifesto of the Italian futurists in the early 20th century, various sounds not previously considered musical began to be heard in artistic settings. Electroacoustic music as a European art form was introduced mid-20th century, with Canadian pioneers Hugh Le Caine and Norman McLaren contributing to the development of unique electronic technologies. Before the introduction of digital synthesizers and the MIDI system in the 1980s, the production of electronic music was largely limited to radio and university-based studios as the equipment was not easily transportable. Eventually, large-scale studios became somewhat obsolete with the introduction of laptops and iPads and other portable gear, making it possible for live and interactive performances. Electronic Dance Music arose in the late 1980s as music created largely for nightclubs, raves and festivals, and was produced for playback by DJs seamlessly mixing tracks. This club-based artform has mushroomed over the years, and this year’s X Avant festival will be a perfect opportunity to hear the latest innovations in these genres. The opening concert of the festival on October 11 promises to be a visual feast with sets by Tasman Richardson, See Monsters, and Creeasian & Bear Witness. Before becoming a musician, Bear had a visual arts career that was mainly video based. Working with images that depicted misrepresentations of Indigenous people in the media, he sampled and reworked this material to create installations and short experimental films, highlighting the empowering aspects of the images and discarding the negative ones. Once ATCR began to take up more of his time, he folded his video work into his DJ sets. Toronto-based Richardson was a huge influence on Bear’s visual work. Richardson will present two new three-channel live A/V performances, the first of which will use glitches from an Atari game console, and the second will use satellite-based images. See Monsters are a duo that come the closest to what ATCR do, using video, sound and sampling of traditional music. Being based in Northwest Coast traditions however, they have a very different aesthetic than ATCR. Bear’s collaboration with dancer and musician Creeasian will give him an opportunity to use some of his video work outside of the Tribe context and is for him another extension of the Halluci Nation idea. Sound artist and DJ, Maria Chávez, who will open the October 12 concert, was a new discovery for Bear who was intrigued by one of her signature DJ processes – using broken LPs layered on the turnable to create her unique sonic language. Bear cites Geronimo Inutiq as one artist who started working in a similar way as ATCR over 20 years ago, working with throat singing as well as electronic music and video production. The October 12 concert will conclude with respectfulchild, a solo instrument project of Gan from Saskatoon on Treaty 6 Territory. These ambient soundscapes are created from nuanced improvisations on their violin, resulting in a sound that takes the listener on an introspective reflective journey. Saturday night’s events on October 13 will feature an all-out beat fest with Los Poetas, Above Top Secret and Ziibiwan at the Music Gallery, then wrapping up the evening with a dance party at The Mod Club. Headlining the dance party will be the sounds of El Dusty’s Colombian cumbia music, an artist with whom ATCR is currently collaborating. Following this will be mixes by two of Toronto’s most highly regarded DJs Dre Ngozi & Nino Brown; finishing off the evening is a set by Bear and his ATCR colleague 2oolman. Closing out the festival on October 14 will be the music of veteran performers and innovators Narcy, Jennifer Kreisberg and Lillian Allen. Narcy is a pioneer of the Arab hip-hop movement working in Montreal, while Kreisberg innovates using multilayers of stunning vocal harmonies. Allen, of course, is well known in Toronto for her groundbreaking work in dub. The festival also offers two occasions for audience members to engage with some of the festival artists. There will be a panel discussion at 6pm on October 14 about the concept of the Halluci Nation and a Sampler Café at 1pm on October 13 hosted by Creeasian where participants will have a chance to try out and play with different digital equipment. This is open to people of all ages and abilities. The Halluci Nation vision is an invitation and call out for all those who find themselves seeking a more just world for all peoples and are committed to helping that come into being. OCT 12, 8PM: Soundstreams, “Six Pianos,” Koerner Hall. Steve Reich’s music returns to Toronto with a performance of Six Pianos (1973), a work that the composer originally wrote for all the pianos in a piano store and subsequently pared down to six pianos. This concert will feature the veteran Reich performer Russell Hartenberger who will be joined by five other local pianists. Other works on the program include music by Ristic, Cage, Lutosławski, Louie and Palmer. OCT 15, 8PM: The Azrieli Music Prizes Gala Concert, Maison symphonique de Montréal. Although a bit of a drive away, this concert will feature Ottawa-based Kelly-Marie Murphy’s composition En el escuro es todo uno (In the Darkness All is One). Murphy wrote this piece after winning the 2018 Azrieli Commission for Jewish Music, one of the biggest prizes for composers in the country. An interview with Murphy about her vision for this composition can be read in the October 2017 edition of The WholeNote. OCT 24, 8PM: Esprit Orchestra. “For Orbiting Spheres,” Koerner Hall. Esprit Orchestra opens their current season with four orchestral works inspired by the various phenomena of the cosmos. Two Canadian premieres of works by Missy Mazzoli (USA) who composed Sinfonia (For Orbiting Spheres) and Unsuk Chin (Korea) are paired with Netherlands composer Tristan Keuris’s Sinfonia and Charles Ives’ tour de force An Unanswered Question. A heavenly night of music. OCT 26 TO 28, 8PM: Arraymusic/Exquisite Beat Theatre, Rat-drifting 2: SlowPitchSound presents: Alternate Forest, Array Space. Rat-drifting is a concept developed by Martin Arnold to bring together free improvisation, noise, psychedelic process music and DIY para-punk composition. This month’s version features SlowPitchSound’s multidisciplinary adventure into a mystical forest space combining sound, dance and video. For the opening column of the new season, I thought I’d take a look at two new CDs being released by the prolific and virtuosic Canadian pianist Christina Petrowska Quilico. The first CD, Soundspinning, offers a series of older works composed by her friend and colleague, the late Ann Southam. It will be released on the Canadian Music Centre’s (CMC) Centrediscs label, with the official launch happening on September 25 at the CMC in Toronto. The second CD, Global Sirens, on the Fleur de Son/Naxos label, features the music of 15 different internationally-based composers and includes a total of 19 compositions, including two works by Canadians. Southam: Petrowska Quilico is well known for her interpretations of Southam’s music, having already released seven CDs of Southam’s compositions including Glass Houses, Pond Life and Rivers, each one released as box sets. However, this recent CD is unique, as it consists of a number of rarely heard Southam works from 1963 to 1999. As Petrowska Quilico told me in our recent interview, Southam used to joke: “I love it when you root around in my old pieces and come up with something new.” When it came to choosing repertoire and creating an order for this new CD, Petrowska Quilico crafted it with careful attention to the flow of changes in mood and tempo between the works, quipping that in a sense she was creating a sonata in a very unorthodox way – a sonata whose contrasting movements were being fashioned from the different Southam compositions. The album opens with Stitches in Time, composed in 1979 and revised in 1999. This work is comprised of two small collections of pieces: three pieces in Sonocycles and eight in Soundspinning. They are all short and fast pieces that reflect Southam’s love of nature, and are precursors to the larger Rivers and Glass Houses works. Petrowska Quilico spoke about how they were harder to play than they look, and have no indications regarding phrasing, dynamics or pedalling. Because of the 30-year working relationship she had enjoyed with Southam, this didn’t create a stumbling block for her. She approached them in a similar way to Rivers, accentuating hidden melodies and altering the tempos to create a more shimmering effect, making each one shine with its own unique characteristics. During their work together in preparing the Rivers CD, Southam had told her she trusted Petrowska Quilico’s musical judgment completely. And even though they are fast virtuosic pieces, they still require control, which Petrowska Quilico admits may seem like a bit of a contradiction. The next few works are a series of Southam’s jazz-inflected pieces – Three in Blue (1965), Five Shades of Blue (1970) and Cool Blue; Red Hot (1980), all of which Petrowska Quilico selected due to her own love of playing jazz. The concluding work on the CD is Remembering Schubert from 1993 – a piece that also appears on the CBC album Glass Houses: The Music of Ann Southam, performed by pianist Eve Egoyan, who also enjoyed a special bond with the composer. Global Sirens: Petrowska Quilico has spent a good deal of her career promoting the music of women composers, and this love and commitment is reflected in her second CD coming out this fall – Global Sirens. Her desire with this CD is “to show the great wealth of women’s compositions. Not to denigrate men’s compositions, but we hear more of them than we do the women,” she said. Arising out of the research she’s undertaken for her York University Gender and Performance course, she has uncovered many lost compositions and composers, a selection of which are on the CD. Primarily these are works that span the 20th century, and include composers from numerous backgrounds. One such example is the opening piece Langsamer Waltz composed by Else Fromm-Michaels, whose compositions were banned during the Nazi period because her husband was Jewish. Other composers represented include Else Schmitz-Gohr and Barbara Heller, also from Germany, Ada Gentile (Italy), Priaulx Rainier (South Africa), Peggy Glanville-Hicks (Australia) and French composers Lili Boulanger and Germaine Tailleferre, who was one of Les Six along with Milhaud, Poulenc and others. The two Canadians represented are Larysa Kuzmenko and Sophie-Carmen Eckhardt-Gramatté. Petrowska Quilico has included four pieces by American composer Meredith Monk, whose music she loves, as well as Wireless Rag (1909) by Adaline Shepherd, a woman who was forced by her husband to give up composing, until she was able to resume her creative life after his death (an event which made her quite happy, Petrowska Quilico remarked). Shepherd had great success with her rag Pickles and Peppers, which sold over 200,000 copies in 1906 and was used as a theme song by William Jennings Bryan during his presidential campaign in 1908. This little slice of Shepherd’s experience offers us just a glimpse at the hostile environment many women composers faced in the past. But what about now? I asked what she thought about the current climate for women music creators in Canada and Toronto. She began by recounting the story of performing Violet Archer’s Piano Concerto No.1 in 1982. At that time, an entry in an American encyclopedia had listed it as one of the major concertos written in Canada – it had been composed in 1956 – and despite this acknowledgement, the piece had only received one performance in 1958 under the baton of Victor Feldbrill with the CBC Symphony. This was something that was quite upsetting to Archer, and so Petrowska Quilico set out to perform it again and eventually released it as a recording. It’s now available on the Centrediscs album 3 Concerti, which also includes works by Alexina Louie and Larysa Kuzmenko. On the subject of gender parity in programming, Petrowska Quilico feels that music composed by women should definitely be played more often, and concerts should include a good balance of pieces by both genders, as well as older works along with newer ones. “Let’s make sure we don’t forget the women and Canadian composers of the past, and sprinkle them through the programs.” The problem, she stated, is that the emphasis is on premieres, and it is often a fight to get women’s music played more than once. All the training, practice and inner focus come together for the performance – and these two new CDs will be a welcome addition to her ongoing contribution to Canadian musical life. SEP 8, 7:30PM: CMC Centrediscs, Bekah Simms’ impurity chains CD launch, Canadian Music Centre. In the spirit of celebrating new CDs by women creators, this launch marks the first recording of Simms’ music that abounds with the sounds of 21st-century chaos. Combining both acoustic and electroacoustic soundworlds, Simms weaves references to diverse traditions, from folk to concert. SEP 12, 8PM: Guelph Jazz Festival. SUNG RA, Guelph Little Theatre. Rory Magill’s take on the legendary Sun Ra with his own Rakestar Arkestra combined with Christine Duncan and the Element Choir. SEP 16, 8PM: Guelph Jazz Festival. Allison Cameron and Ben Grossman, Silence. These two eclectic composers join forces to perform improvisations on a wide array of instruments and objects, percussion, and electronics. SEP 27, 12PM: Canadian Opera Company, Awasaakwaa (Beyond, on the Other side of the Woods), Richard Bradshaw Amphitheatre. A solo recital by acclaimed Odawa First Nation composer and performer Barbara Croall, presenting her own compositions for voice and pipigwan (Anishinaabe cedar flute). Croall is currently preparing for a major performance piece about Saint Kateri Tekakwitha, a Mohawk woman who was made a saint. More details about that coming later this fall. OCT 6, 8PM: New Music Concerts, Linda Bouchard’s Murderous Little World, Betty Oliphant Theatre. NMC begins its new season with this music and theatre performance work, directed by Keith Turnbull with texts by Anne Carson. Combining an electronic score with live performers who double as actors, this event promises an emotional experience full of artistic electricity and intellectual prowess. With the arrival of warmer weather, it’s time to dive into the world of summer music festivals. One that caught my attention this year is Festival of the Sound, located in the heart of vacation country, the town of Parry Sound. This year’s festival, which runs from July 20 to August 11, is offering two unique contemporary music events, both of which focus on themes related to cultural identity, history and place. I’ll be concluding the column with a summary of a few new music events happening this summer within the city of Toronto. The piano quartet Ensemble Made in Canada will be premiering their unique and ambitious Mosaïque Project at Festival of the Sound on July 26. The ensemble got their start in 2006 at the Banff Centre for the Arts, when Angela Park (piano) and Sharon Wei (viola) were inspired to begin a chamber music ensemble that would enable the two of them to play together – thus a piano quartet was formed rather than the usual choice for chamber ensembles, the string quartet. Additional members of the current quartet include Elissa Lee (violin) and Rachel Mercer (cello), and it was Lee who I had a conversation with about Mosaïque. A few years ago, the quartet began brainstorming about future projects, and had the vision of travelling across the country by train. Not able to physically manage it – since until recently taking a cello on VIA Rail was not allowed – they came up with the idea of commissioning a piece of music that would do it for them. The original idea was to commission 13 composers (one for each province and territory), but later this increased to 14 composers, who were then selected based on the quartet’s attraction to their individual compositional styles rather than on where they lived. After the composers were on board, the quartet then came up with a strategy to allocate a specific province/territory to each composer to serve as the initial starting point for their compositions. As things turned out, even though each composer was given free reign to find their own inspiration related to the assigned province/territory, a majority of them chose the theme of water as their point of departure. In our conversation, Lee remarked how nature is “so close to our hearts as Canadians,” so it’s no surprise that this would emerge as a common thread amongst the creators. Each of the pieces is four minutes in length, and in the premiere performance in Parry Sound, all 14 of these miniatures will be woven together. An extensive tour is planned across the country after the premiere, with dates and locations scheduled into the fall of 2019 and a changing set list of Mosaïque selections for each show. Audiences in Toronto will be able to hear the complete set of 14 works on November 15, as part of Music Toronto’s concert season and their full touring schedule is available on their website. One of the distinctive features of this project is a visually based component that will engage the audience. During the concert, audience members will have the opportunity to doodle or draw while listening. Lee explained that many audience members only want to experience familiar music and are more skeptical of contemporary pieces. Based on Lee’s own practice of doodling while talking on the phone, she had the inspiration that if people were doing something more unconscious like doodling, “they could abstract the music and be less apt to judge it. By engaging in a drawing experience, people are able to tap into their own creativity and draw something based on what they’re hearing to inspire them. It opens up a different approach to how you digest the music and is much more friendly. People may find themselves hearing something in the music they would otherwise miss,” Lee said. The other goal of the visual element is to concretely capture how the music is inspiring the audiences. “Canada is inspiring the composers, the composers are inspiring the ensemble, and since the concert is travelling throughout the country, the music is inspiring a nation-wide audience. We can capture what is being created and put it on our website, creating a visual mosaic as another layer to how we celebrate and represent our country.” Through the Mosaïque Project, Canada’s diversity and richness are celebrated not only through the music, but also through the eyes and ears of its people. The second contemporary music event at the Festival of the Sound is the world premiere of Sounding Thunder: The Song of Francis Pegahmagabow, composed by Timothy Corlis and written by Ojibwe poet Armand Garnet Ruffo. Corlis explained that the work is not an opera, but rather a story that includes a narrator, a chamber ensemble of instrumentalists, three Ojibwe singers and an actor who plays Pegahmagabow. Performing this role is Brian McInnes, the great grandson of Pegahmagabow and writer of an extensive biography of his great grandfather. Other direct descendants have acted as advisors for the project. Pegahmagabow was born in 1889 on the Parry Island Indian Reserve (now the Wasauksing First Nation), an Ojibwe community near Parry Sound, Ontario. He was considered the most effective sniper of World War I and was decorated with various military medals. The writer Armand Ruffo took great pains to reference real events in the script, Corlis told me, using either things commonly talked about in the family or documentation from books. The instrumentation of the music was designed to be a copy of what is used in L’Histoire du Soldat, Igor Stravinsky’s piece about World War I. Corlis’ vision is that for future performances, excerpts of Stravinsky’s work will be performed on the same program, thus presenting different viewpoints of this cataclysmic world event. Sounding Thunder is divided into three acts, with the first focusing on Pegahmagabow’s childhood and formational spiritual experiences, including an encounter with the spirit of his clan – the Caribou. In the music, Corlis has created a Caribou motive using interlocking patterns invoking the sounds of a large herd. One of the singers will portray the spirit of the Caribou throughout the work, which opens with Pegahmagabow acknowledging the four directions while vocables are sung. At another point, the instruments foreshadow the war with rippling gunshot sounds on the drum. Act Two takes us to the battlefield in Europe and musically, the score has many references to European music and its harmonic traditions. Corlis said that the music even sounds a bit like Bach’s St. Matthew Passion, yet there is another unmistakable component – the presence of the drum, which is played with great force underneath the European-based music. This was one way Corlis brought together references to both cultures, as the drum is a significant element in Ojibwe culture and customarily resides in the home of its owner. Act Three focuses on Pegahmagabow’s life after returning to his home after the war. Despite his many accomplishments on the battlefield and his ability to gain loyalty and trust in his role as an army sergeant, when back on the reserve, he had to once again face the systemic racism towards First Nations people. Much of the third act portrays his struggles with the Indian agent, fighting for the rights to receive his military pension and for all Indigenous people to have access to legal advice. Writer Armand Ruffo is a strong activist for Indigenous rights, and this is very evident in the script. The work ends with Pegahmagabow’s death, with the instrumentalists surrounding him onstage while playing gentle light trill motives to represent the ascension of his spirit, with the finale being the performance of a traditional Ojibwe song. Somewhere There: On June 10, at Array Space, Somewhere There will present the first screening of Sound Seed: Tribute to Pauline Oliveros, a performance by Vancouver-based integrated media artist Victoria Gibson. The piece draws on Gibson’s 2009 encounter with composer Pauline Oliveros and members of the Deep Listening Band, who invited her to document their 20th anniversary that took place in the underground cistern in Fort Worden, Washington with its spectacular 45-second reverberation. This was the site of the groundbreaking 1989 recording Deep Listening, which launched both the term and concepts of Deep Listening, Oliveros’ signature work which invites us to engage with and contribute to the sonic environment from a place of inner focus and awareness. The concert includes a launch of the DVD along with two sets of music. Vocalist/composer Laura Swankey opens the evening, with the closing set featuring Gibson performing with Heather Saumer (trombone) and Bob Vespaziani (electronic percussion), a version of Gibson’s variable-member project, Play the Moment Collective. Contact Contemporary Music: A unique concert on June 14 co-presented by ContaQt and Buddies in Bad Times Theatre, “Many Faces: We Are All Marilyns,” will explore the themes of vulnerability, strength and defiance, topics that are particularly relevant in light of recent issues of violence within Toronto’s queer community. Music by Eve Beglarian, Amnon Wolman and John Oswald will be performed, along with choreography by Laurence Lemieux. Fast forwarding to the Labour Day weekend, Contact’s annual multi-day festival INTERSECTION takes place from August 31 to September 4, and is a co-presentation with Burn Down the Capital. This year’s event offers an extensive lineup of musicians, with their opening concert featuring NYC-based experimental metal guitarist and composer Mick Barr, the Thin Edge New Music Collective, and heavy metal band Droid. The day-long event on September 2 will take place as usual at Yonge- Dundas Square, with music performed in the midst of an intense urban scene. By contrast, the final concert will take place at Allan Gardens, with another opportunity to hear Laura Swankey, amongst others. Luminato: An exciting new work which combines sound, image and an unspoken narrative, Solo for Duet: works for augmented piano and images, will be performed by pianist Eve Egoyan on June 19 and 20. I refer you to my April column, which features a more detailed description of this work, along with a look at Egoyan’s performances of long-duration works. On June 24, Icelandic composer and musician Ólafur Arnalds premieres his new work All Strings Attached, featuring a wired ensemble of string quartet and percussion, with Ólafur performing on an array of pianos and synthesizers. A highlight of this work will be Ólafur’s use of intricate algorithm software, which he designed to control two self-playing pianos acting as one. Keeping apace of new music events in the city is like a never-ending discovery of new ideas, initiatives and opportunities to expand one’s horizons on both the local and international scenes. The Royal Conservatory’s annual 21C Music Festival, running from May 23 to 27, provides an opportunity to experience all this within a five-day span, with eight concerts and 37 premieres. 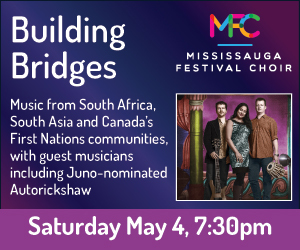 The Kronos Quartet, along with composer and multi-instrumental performer Jherek Bischoff, will open the festival, followed by concerts featuring a number of different international and national pianists, including Anthony de Mare with his special project Liaisons: Re-Imagining Sondheim From the Piano, Sri Lankan-Canadian composer and pianist Dinuk Wijeratne performing with Syrian composer and clarinetist Kinan Azmeh, and the French sibling pianists Katia and Marielle Labèque. As is customary for 21C, one of their concerts is a co-presentation with an established Toronto new music presenter – in this case, New Music Concerts, who will bring a Claude Vivier-inspired program to Mazzoleni Hall on May 27. This year, however, a second co-presentation also caught my eye: Grammy Award-winning vocal ensemble Vox Clamantis with Maarja Nuut & HH, presented on May 26 in collaboration with Estonian Music Week, running concurrently in the city from May 24 to 29. The Estonian Music Week co-presentation is one of two concerts at 21C that combine music by contemporary composers with music of the past – thus creating a blurring of time, as it were. Vox Clamantis will offer both Gregorian chant music alongside contemporary works by primarily Estonian composers – while in another 21C show on May 25, pianist Simone Dinnerstein and the A Far Cry chamber orchestra will combine two works by J.S. Bach and two by Philip Glass. One of the composers the ensemble has a very close working relationship with is the esteemed Estonian composer Arvo Pärt. Back in 1980, Pärt was forced to leave Estonia, which was part of the USSR at the time, in order to have his creative freedom. He lived in Berlin for 30 years, only returning to Estonia in the late 1990s after the country regained its independence. A strong relationship between Pärt and Vox Clamantis was quickly established, strengthened by the fact that Pärt had studied Gregorian chant when he was young. “We found a lot of similarities in our musical expressions and understandings of music, and little by little we sang more and more music that he wrote for us. He also often comes to us with new compositions while he is working on them so he can hear what they sound like,” Tulve said. The program at the 21C Festival will include five pieces by Pärt, all of which are on The Deer’s Cry CD, an album fully dedicated to performances of Pärt’s music by Vox Clamantis. As well, one of the repertoire programs that the ensemble regularly performs is comprised of a mixture of Pärt’s music with Gregorian music, a program designed by both Tulve and Pärt. Two other Estonian performers will also take to the stage that same evening – Maarja Nuut, performing on vocals, violin and electronics, along with Hendrik Kaljujärv on electronics. For the evening finale, the choir and these two young experimental performers will come together with a work performed by Vox Clamantis with improvisations by Nuut and Kaljujärv. One of the pianists the 21C Festival is programming is Brooklyn-based Simone Dinnerstein, who burst onto the international scene with her self-produced recording of Bach’s Goldberg Variations in 2007. Since that time, she has performed internationally, with repertoire spanning from Baroque to select 21st-century works especially composed for her. Recently, she entered into a creative collaboration with composer Philip Glass, whose Piano Concerto No. 3 for piano and strings will receive its Canadian premiere at 21C along with pieces by J.S. Bach and Glass’ Symphony No.3. The concerto was a co-commission from a consortium of 12 orchestras; it was premiered in Boston in 2017 with string orchestra A Far Cry. In my recent phone interview with her, Dinnerstein spoke about how this came about. The idea arose in 2014 when both artists discovered that they had a mutual interest in the music of Bach. Glass was interested in writing a work for her and Dinnerstein proposed that it be a concerto for piano and string orchestra. “I thought it would be interesting if the performance of the piece was paired with a Bach concerto,” she said. “All of Bach’s keyboard concertos are for keyboard and string orchestra, and there haven’t been many pieces written for that combination since Bach’s time. Glass liked the idea and from there, along with A Far Cry, we all decided it would be interesting to create a whole program with music by Bach and Glass.” At the May 25 concert, the first half includes Glass’ Symphony No. 3 followed by Bach’s Keyboard Concerto in G Minor BWV1058, and in the second half, Bach’s Orchestral Suite No. 2 in B Minor will be followed by Glass’ new Piano Concerto. And just in time for the festival, the two keyboard concertos on the program will be available on a CD titled Circles. What is striking about both these concerts I’ve highlighted here is the way contemporary music is linked with the sensibilities of both medieval Gregorian chant and Baroque music. It will definitely make for some fascinating listening – and an opportunity to experience music in all its timelessness. One of the inspiring things about the new music scene in Toronto is the plenitude of presenter organizations and collectives that are constantly springing up, each one with their own unique vision and mandate. One of the newer players in this trend is the Caution Tape Sound Collective, formed in the summer of 2015 by composers Bekah Simms and August Murphy-King. On March 24 in Array Space, Caution Tape will present “Spark to Stone” in collaboration with the Association of Canadian Women Composers (ACWC). The concert features the work of seven Canadian composers, including five world premieres and two Toronto premieres. I invited Bekah Simms to have a conversation about the concert, the collective and her own compositional work. Their upcoming March 24 concert is one example of their focus on representational programming as they join forces with the ACWC, which was formed in September of 1981 with the aim of addressing the lack of women composers being programmed in the Canadian music scene. The Caution Tape/ACWC collaboration is a natural one: Simms has served on the board of the ACWC, and together they put out a call for works – both existing as well as proposals for new pieces. As a result of this call, the Spark to Stone concert will include works by composers Amy Brandon, Sarah Reid, Ivana Jokic, Hope Lee and Lesley Hinger, along with Caution Tape core members Simms and Mermelstein. Mermelstein’s work is an acousmatic piece, a form of electroacoustic music that is specifically created as a listening experience using only speakers, as opposed to a live instrumental performance. She has used the mundane and background sounds of everyday life and through various forms of digital processing brought this world to the forefront of an intriguing listening experience. Brandon’s work uses a soundscape created from unique piano preparations – nylon fishing wire attached to the wall and woven into the lower strings of the piano. Jokic’s piece uses the concept of the palindrome, a sequence of events that reads the same backward as forward. There is an allusion to matryoshka dolls, the Russian nesting dolls, as the snaking palindromes weave their way throughout the ensemble. Reid, a trumpet player who is both an improviser and composer, created a piece for prepared piano, cello, and amplified objects performed by a percussionist. This includes the playing of the grain of a piece of wood that has been covered with contact mics, a pair of vampire-like chattering teeth and a cassette player. Lee’s work …I, Laika…, composed in 1996, will finally receive its Toronto premiere. A 20-minute work for flute, cello and piano, the piece is based on the idea of doomed flight, referencing Laika, the first dog launched in space by the Russians, as well as the loss of Lee’s father who went missing in a military plane in China. Hinger’s participation is an example of the value of putting out a call and connecting with unfamiliar voices. Once the jury for the concert heard her music, they unanimously agreed that her work must be selected. Hinger’s piece for solo violin is informed by her current studies in spectralism and focuses on slow microtonal unravelling over time. As for future directions, what drives her is to integrate more complex and intricate technologies into her music. In a recent mentorship with Montreal acousmatic composer Martin Bédard, she was able to learn a variety of electroacoustic techniques, and had an opportunity to work with live diffusion, the process of moving the sound amongst a multi-speaker system. The next step for Simms will be to work in partnership with a programmer to create an intuitive interface to perform live processing of instrumental sounds. The composition she is creating will be scored for solo cello, electronics and orchestra, and is scheduled to be performed by Esprit Orchestra in February 2019 during their New Wave Festival. Having a skilled electronics performer working alongside her is her ideal situation, for it allows her to focus on composing the electronic component, which can then be realized externally by an expert. Simms notes the tendency for presenters to be satisfied with having had one successful experience and then to stop thinking about it. “You have to be actively questioning your programming every step of the way. It’s so easy to find good and interesting work by women that if you’re not programming it, you’re just being lazy.” She mentioned a 1990s article in the Toronto Star that noted the lack of programming of works by women amongst the new music organizations – and that was 25 years ago! Caution Tape attempts to “be steadfast about our programming. If one concert ends up being a 70/30 mix between male and female composers, we shuffle things around in the overall season to get closer to 50/50.” She noted that it’s easier for chamber music groups to have more diverse programming, and that many local groups regularly program music by women on every concert. “The problem is with the larger ensembles, that’s where the numbers are the worst. You hope that your efforts in the chamber music realm will bleed into the larger sphere of orchestral music,” Simms says, mentioning as an example, that the rising star of orchestral composition globally is Icelandic composer Anna Thorvaldsdottir who was chosen in 2015 as the New York Philharmonic’s Kravis Emerging Composer. The Philharmonic will give the world premiere of Thorvaldsdottir’s latest commissioned work, Metacosmos, on April 4 to 6. (Coincidentally, during the writing of this column, I received a press release regarding the Chicago Sinfonietta’s concert on March 11 celebrating women composers. This orchestra is dedicated to modelling and promoting diversity, inclusion and racial and cultural equity in the arts. In light of these initiatives, it feels like Toronto is lagging behind; all the more reason why the Caution Tape Sound Collective is a much-needed voice in the city. An important footnote to this conversation about orchestral programming: I would be remiss not to mention two upcoming orchestral performances of works by composer Vivian Fung. On March 24, the National Arts Centre Orchestra will give the Toronto premiere of her newly commissioned piece Earworms, and on March 3, Fung’s 2011 piece Dust Devils will be performed by the TSO as part of the New Creations Festival.